Happy Thursday! It's almost the weekend. I hope you've been having a good week. Thank you for all the nice things you said about my blog after my last post. I hope you know I wasn't fishing for compliments, but it's lovely to receive them all the same. I really just wanted to let you know that I've been struggling a little bit lately with blogging. I worry sometimes that there isn't much I can share here that will keep people's attention anymore. I shouldn't let myself get caught up in those kinds of thoughts, but it does happen now and then. The main thing is that I love blogging and I plan to keep doing it. Thanks again for your support and kindness, and for sticking around to read what I share here. It makes me happy to know that I bring something enjoyable to your life. Today, I want to share something new I've been working on. I have been hoping to expand my crochet horizons lately, by trying to create more wearable items, and using different kinds of yarn. That's one reason I've been trying to plow through my sizeable stash of worsted acrylic yarn, which is most appropriate for blankets. I'd like to have more space for other types of yarn, to make different things. I've wanted to do this for a while now, but it was a little daunting when I thought about all the yarn I needed to move out before I could. After Big Gulp, I've made a good dent, so I'm letting myself take a little dip into the new frontiers I've been dreaming about. I'm trying my hand at lace crochet! Yes. I'm starting with the very popular Elise Shawl by Evan Plevinski (link goes to Ravelry; there's a free pattern download). I have had the pattern in my Ravelry library for several years. I've always liked the look of this design when I've seen it on blogs (Meredith is a prolific maker of beautiful Elise Shawls). Also, the shawl shares its name with someone very dear to me, which is one reason it caught my eye in the first place. It took several tries to get to grips with the pattern, which was very confusing to me at first. I finally figured it out and it's been smoother since, but I wouldn't say easy, exactly. Not yet. I'm working fairly slowly and I have a long way to go, but it is making more sense now. One cool thing is that I'm using a stitch marker as I work, to help me keep track of the center stitch in each row. I recently upgraded from my first set of plastic markers, which were breaking one by one as I used them (I guess the plastic dried out or something), to much more durable metal ones. I feel like a Really Serious Fiber Artist. The shawl is meant to be crocheted with a light yarn, such as sock-weight. I'm still learning about yarn types and weights - I've pretty much only used worsted or DK/baby/sport-weight yarn in most of my crochet, with a few attempts at thread crochet. So I wasn't totally sure what to use for this shawl, but in my poking around at the craft store, I came across Lion Brand Shawl in a Ball, which seemed like a really good way to start. Plenty of yardage, a light, airy weight, and many pretty variegated colorways, so I didn't need to worry about buying lots of shades. The yarn is a cotton-acrylic blend; the colored part is acrylic and the white ("slub") part is cotton. I searched within the Elise Shawl projects on Ravelry for shawls made with Shawl in a Ball, and they looked lovely to me, with the colors pooling beautifully in the crochet. I chose the Calming Desert colorway because I really liked the purple-to-orange progression within it. This yarn has been a learning experience for me; it's finer and softer than most yarns I've used, and the texture is a bit inconsistent - smooth and silky in some places, sort of fuzzy in others, but I think that's part of the appeal. Worked up, the shawl is lightly rustic, pretty but not overly polished. I'm using an I/9 (5.5mm) hook, one size smaller than Lion Brand's recommendation; for me, the larger hook made the yarn harder to work with. And check this out - blocking mats! 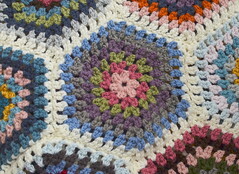 I've only done a little bit of blocking here and there, with small decorations crocheted with cotton yarns. But this shawl is going to need a pretty good amount of blocking and shaping when it's all finished, to give it the beautiful winged shape and to give the stitch pattern the openness and definition needed for the beautiful lacy design to show up. I ordered these Hephaestus Crafts blocking mats, which also included a box of T-pins, from Amazon. I haven't used them yet, but they seem sturdy and well-made, and I'm looking forward to trying them out. I can't wait to see how this shawl works out; I'm not sure it will be gift-grade on my first try, but I'd wear it myself and keep trying. For now, I'm just really glad to be learning something new. 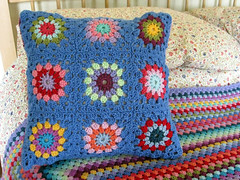 Such a beautiful pattern and yarn choice, love the colours. I can see that it's going to be beautiful! I love the soft look and the colors. I'm so impressed by your talent. Well that is simply beautiful. And I am happy to be a new reader, and am therefore glad you are continuing to blog. I enjoy reading about people's lives. So don't ever feel as if you have nothing to share! Beautiful, you're making such a lovely job of it and it's going to be such a pretty addition to your wardrobe. I like your yarn choice, there's such a large selection of yarn available these days that we're spoilt for choice. You'll be amazed how different it looks after blocking, it really shows off the lace at its best. Good job, Jennifer! Your shawl is pretty. Oh, the world of yarn is so fun! I have the same blocking mats, but mine are yellow. Crochet on with confidence (EZ, but she says knit on). Or Jennifer! I am so excited for you! 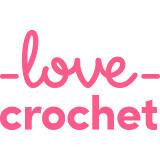 This is going to open up a whole new world of crocheting. I think that maybe you have opened a Pandora’s box! Your shawl is looking absolutely stunning. And I think your yarn choice was spot on. I, for one, I’m so happy that you decided to continue blogging. Your life is much more exciting than mine is and I blog. Ha ha! I like to think of it as sitting down with a cup of tea in the mornings and visiting with my friends. I hope you have a most lovely day today. Look at you go! It is really a great pattern once you get the hang of it and it sure looks like you are moving along nicely. I love the color yarn you have chosen, it will be such fun to see how the colors come out as you move along. I think you are doing a fantastic job and I thank you very much for remembering I have made a few of these, actually quite a few. As for blogging I think with a busy life sometimes it gets put aside, at least for me it does but I find that I miss my friends so much if I am not in touch. Take care Jennifer and good luck with the finish. They are addicting so you had better buy more yarn for number 2.